KDE develops Free, Open Source Software. 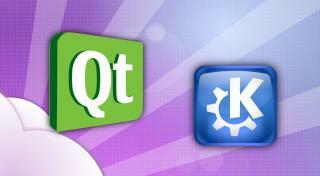 Most of the KDE software uses the Qt library, which is available under compatible free licenses. The continued availability of Qt as Free Software is safeguarded by the KDE Free Qt Foundation, founded in 1998. Qt Developer Days 2012 are the premier Qt events of the year. The 2012 Conference for Europe started today in Berlin co-hosted by KDE e.V. ; there will be news and more information from the Conference over the next few days. Meanwhile, preparations are well underway for Qt Developer Days – North America in Silicon Valley, which will take place December 5 – 7. Digia Director of R&D, Tuukka Turunen, sets out their aims of securing the future of Qt as the best cross-platform development framework and seeking greater cooperation with KDE and other partners in the Qt ecosystem. Today Nokia announced the start of the open governance model for Qt, known as the Qt Project. The Qt Project allows both companies and individuals to contribute to the development of Qt. KDE supports this move and is excited about the possibilities it brings. We have been waiting for opportunities to take a more active role in Qt's future for a long time and open governance will make this easier. Over the last few weeks a phenomenon has been sweeping the cultural headlines of Norway. Qt Community Manager and friend of KDE Knut Yrvin has been amazing the judges of Norske Talenter (Norway's Got Talent) with his robotic moves (YouTube video). Tonight is the final and Knut has made it to the last few contestants. The streets of Oslo will be silent as everyone will be eagerly watching the Norwegian Ant and Dec introduce the acts. Will Knut triumph or will the judges buzz him out? KDE will be backing him all the way. Update: unfortunately he failed to make first place, the Norwegian Simon Cowell must have just as poor judgement as the original. Knut will always be a winner with KDE and we look forward to a repeat performance at Akademy. Coverage on YouTube. Earlier today, Qt Software released updates to Qt and Qt Creator. Both releases are available for download from http://qtsoftware.com/downloads -- either stand-alone or as part of a new build of the Qt SDK. Qt 4.5.1 includes bugfixes and optimizations made since the release of Qt 4.5.0. Qt Creator 1.1 incorporates a good deal of user feedback gathered since the 1.0 release, and provides a broad collection of improvements and additions. Today, the Qt Marketing Team has launched a new website to engage the community in a different way: QtOverload.com. This site is dedicated to unusual Qt development and will mirror the diversity of the ecosystem surrounding Qt. Qt Software directly asks for submissions by their readers and hopes for a broad spectrum of contributions ranging from mockups to actual applications that make use of Qt technology. If you have anything you would like to contribute yourself, please, send an email to submissions [at] qtoverload [dot] com.